(1) If, when I attain Buddhahood, there should be in my land a hell, a realm of hungry spirits or a realm of animals, may I not attain perfect Enlightenment. (2) If, when I attain Buddhahood, humans and devas in my land should after death fall again into the three evil realms, may I not attain perfect Enlightenment. (3) If, when I attain Buddhahood, humans and devas in my land should after death fall again into the three evil realms, may I not attain perfect Enlightenment. (4) If, when I attain Buddhahood, humans and devas in my land should not all be of one appearance, and should there be any difference in beauty, may I not attain perfect Enlightenment. (5) If, when I attain Buddhahood, humans and devas in my land should not remember all their previous lives, not knowing even the events which occurred during the previous hundred thousand kotis of nayutas of kalpas, may I not attain perfect Enlightenment. (6) If, when I attain Buddhahood, humans and devas in my land should not possess the divine eye of seeing even a hundred thousand kotis of nayutas of Buddha-lands, may I not attain perfect Enlightenment. (7) If, when I attain Buddhahood, humans and devas in my land should not possess the divine ear of hearing [268a] the teachings of at least a hundred thousand kotis of nayutas of Buddhas and should not remember all of them, may I not attain perfect Enlightenment. (8) If, when I attain Buddhahood, humans and devas in my land should not possess the faculty of knowing the thoughts of others, at least those of all sentient beings living in a hundred thousand kotis of nayutas of Buddha-lands, may I not attain perfect Enlightenment. (9) If, when I attain Buddhahood, humans and devas in my land should not possess the supernatural power of travelling anywhere in one instant, even beyond a hundred thousand kotis of nayutas of Buddha-lands, may I not attain perfect Enlightenment. (10) If, when I attain Buddhahood, humans and devas in my land should give rise to thoughts of self-attachment, may I not attain perfect Enlightenment. (11) If, when I attain Buddhahood, humans and devas in my land should not dwell in the Definitely Assured State and unfailingly reach Nirvana, may I not attain perfect Enlightenment. (12) If, when I attain Buddhahood, my light should be limited, unable to illuminate at least a hundred thousand kotis of nayutas of Buddha-lands, may I not attain perfect Enlightenment. (13) If, when I attain Buddhahood, my life-span should be limited, even to the extent of a hundred thousand kotis of nayutas of kalpas, may I not attain perfect Enlightenment. (14) If, when I attain Buddhahood, the number of the shravakas in my land could be known, even if all the beings and pratyekabuddhas living in this universe of a thousand million worlds should count them during a hundred thousand kalpas, may I not attain perfect Enlightenment. (15) If, when I attain Buddhahood, humans and devas in my land should have limited life-spans, except when they wish to shorten them in accordance with their ogirinal vows, may I not attain perfect Enlightenment. (16) If, when I attain Buddhahood, humans and devas in my land should even hear of any wrongdoing, may I not attain perfect Enlightenment. (17) If, when I attain Buddhahood, innumerable Buddhas in the land of the ten quartersshould not all praise and glorify my Name, may I not attain perfect Enlightenment. (18) If, when I attain Buddhahood, sentient beings in the lands of the ten quarters who sincerely and joyfully entrust themselves to me, desire to be born in my land, and call my Name, even ten times, should not be born there, may I not attain perfect Enlightenment. Excluded, however, are those who commit the five gravest offences and abuse the right Dharma. (19) If, when I attain Buddhahood, sentient beings in the lands of the ten quarters, who awaken aspiration for Enlightenment, do various meritorious deeds [268b] and sincerely desire to be born in my land, should not, at their death, see me appear before them surrounded by a multitude of sages, may I not attain perfect Enlightenment. (20) If, when I attain Buddhahood, sentient beings in the lands of the ten quarters who, having heard my Name, concentrate their thoughts on my land, do various meritorious deeds and sincerely transfer their merits towards my land with a desire to be born there, should not eventually fulfil their aspiration, may I not attain perfect Enlightenment. (21) If, when I attain Buddhahood, humans and devas in my land should not all be endowed with the thirty-two physical characteristics of a Great Man, may I not attain perfect Enlightenment. (22) If, when I attain Buddhahood, bodhisattvas in the Buddha-lands of other quarters who visit my land should not ultimately and unfailingly reach the Stage of Becoming a Buddha after One More Life, may I not attain perfect Enlightenment. Excepted are those who wish to teach and guide sentient beings in accordance with their original vows. For they wear the armour of great vows, accumulate merits, deliver all beings from birth-and-death, visit Buddha-lands to perform the bodhisattva practices, make offerings to Buddhas, Tathagatas, throughout the ten quarters, enlighten uncountable sentient beings as numerous as the sands of the River Ganges, and establish them in the highest, perfect Enlightenment. Such bodhisattvas transcend the course of practice of the ordinary bodhisattvas, manifest the practices of all the bodhisattva stages, and cultivate the virtues of Samantabhadra. (23) If, when I attain Buddhahood, bodhisattvas in my land, in order to make offerings to Buddhas through my transcendent power, should not be able to reach immeasurable and innumerable kotis of nayutas of Buddha-lands in as short a time as it takes to eat a meal, may I not attain perfect Enlightenment. (24) If, when I attain Buddhahood, bodhisattvas in my land should not be able, as they wish, to perform meritorious acts of worshipping the Buddhas with the offerings of their choice, may I not attain perfect Enlightenment. (25) If, when I attain Buddhahood, bodhisattvas in my land should not be able to expound the Dharma with the all-knowing wisdom, may I not attain perfect Enlightenment. (26) If, when I attain Buddhahood, there should be any bodhisattva in my land not endowed with the body of the Vajra-god Narayana, may I not attain perfect Enlightenment. (27) If, when I attain Buddhahood, sentient beings should be able, even with the divine eye, to distinguish by name alculate by number all the myriads of manifestations provided for the humans and devas in my land, which are glorious and resplendent and have exquisite details beyond description, may I not attain perfect Enlightenmet. (28) If, when I attain Buddhahood, bodhisattvas in my land, even those with little store of merit, should not be able to [268c] see the Bodhi-tree which has countless colours and is four million li in height, may I not attain perfect Enlightenment. (29) If, when I attain Buddhahood, bodhisattvas in my land should not acquire eloquence and wisdom in upholding sutras and reciting and expounding them, may I not attain perfect Enlightenment. (30) If, when I attain Buddhahood, the wisdom and eloquence of bodhisattvas in my land should be limited, may I not attain perfect Enlightenment. (31) If, when I attain Buddhahood, my land should not be resplendent, revealing in its light all the immeasurable, innumerable and inconceivable Buddha-lands, like images reflected in a clear mirror, may I not attain perfect Enlightenment. (32) If, when I attain Buddhahood, all the myriads of manifestations in my land, from the ground to the sky, such as palaces, pavilions, ponds, streams and trees, should not be composed of both countless treasures, which surpass in supreme excellence anything in the worlds of humans and devas, and of a hundred thousand kinds of aromatic wood, whose fragrance pervades all the worlds of the ten quarters, causing all bodhisattvas who sense it to perform Buddhist practices, then may I not attain perfect Enlightenment. (33) If, when I attain Buddhahood, sentient beings in the immeasurable and inconceivable Buddha-lands of the ten quarters, who have been touched by my light, should not feel peace and happiness in their bodies and minds surpassing those of humans and devas, may I not attain perfect Enlightenment. (34) If, when I attain Buddhahood, sentient beings in the immeasurable and inconceivable Buddha-lands of the ten quarters, who have heard my Name, should not gain the bodhisattva's insight into the non-arising of all dharmas and should not acquire various profound dharanis, may I not attain perfect Enlightenment. 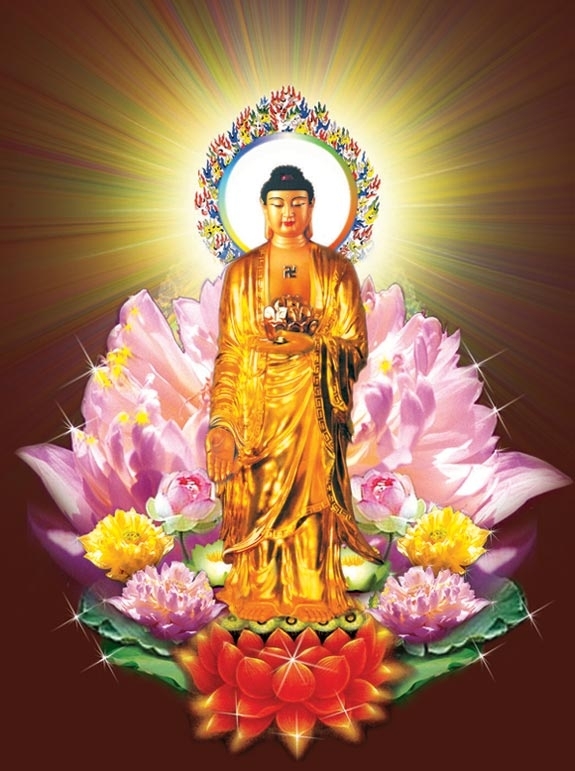 (35) If, when I attain Buddhahood, women in the immeasurable and inconceivable Buddha-lands of the ten quarters who, having heard my Name, rejoice in faith, awaken aspiration for Enlightenment and wish to renounce womanhood, should after death be reborn again as women, may I not attain perfect Enlightenment. (36) If, when I attain Buddhahood, bodhisattvas in the immeasurable and inconceivable Buddha-lands of the ten quarters, who have heard my Name, should not, after the end of their lives, always perform sacred practices until they reach Buddhahood, may I not attain perfect Enlightenment. (37) If, when I attain Buddhahood, humans and devas in the immeasurable and inconceivable Buddha-lands of the ten quarters, who having heard my Name, prostrate themselves on the ground to revere and worship me, rejoice [269a] in faith, and perform bodhisattva practices, should not be respected by all devas and people of the world, may I not attain perfect Enlightenment. (38) If, when I attain Buddhahood, humans and devas in my land should not obtain clothing, as soon as such a desire arises in their minds, and if the fine robes as prescribed and praised by the Buddhas should not be spontaneously provided for them to wear, and if these clothes should need sewing, bleaching, dyeing or washing, may I not attain perfect Enlightenment. (39) If, when I attain Buddhahood, humans and devas in my land should not enjoy happiness and pleasure comparable to that of a monk who has exhausted all the passions, may I not attain perfect Enlightenment. (40) If, when I attain Buddhahood, the bodhisattvas in my land who wish to see the immeasurable glorious Buddha-lands of the ten quarters, should not be able to view all of them reflected in the jewelled trees, just as one sees one's face reflected in a clear mirror, may I not attain perfect Enlightenmet. (41) If, when I attain Buddhahood, the bodhisattvas in my land who wish to see the immeasurable glorious Buddha-lands of the ten quarters, should not be able to view all of them reflected in the jewelled trees, just as one sees one's face reflected in a clear mirror, may I not attain perfect Enlightenmet. (42) If, when I attain Buddhahood, bodhisattvas in the lands of the other quarters who hear my Name should not all attain the samadhi called 'pure emancipation' and, while dwelling therein, without losing concentration, should not be able to make offerings in one instant to immeasurable and inconceivable Buddhas, World-Honoured Ones, may I not attain perfect Enlightenment. (43) If, when I attain Buddhahood, bodhisattvas in the lands of the other quarters who hear my Name should not be reborn into noble families after their death, may I not attain perfect Enlightenment. (44) If, when I attain Buddhahood, bodhisattvas in the lands of the other quarters who hear my Name should not rejoice so greatly as to dance and perform the bodhisattva practices and should not acquire stores of merit, may I not attain perfect Enlightenment. (45) If, when I attain Buddhahood, bodhisattvas in the lands of the other quarters who hear my Name should not all attain the samadhi called 'universal equality' and, while dwelling therein, should not always be able to see all the immeasurable and inconceivable Tathagatas until those bodhisattvas, too, become Buddhas, may I not attain perfect Enlightenment. (46) If, when I attain Buddhahood, bodhisattvas in my land should not be able to hear spontaneously whatever teachings they may wish, [269b] may I not attain perfect Enlightenment. (47) If, when I attain Buddhahood, bodhisattvas in the lands of the other quarters who hear my Name should not instantly reach the Stage of Non-retrogression, may I not attain perfect Enlightenment. (48) If, when I attain Buddhahood, bodhisattvas in the lands of the other quarters who hear my Name should not instantly gain the first, second and third insights into the nature of dharmas and firmly abide in the truths realized by all the Buddhas, may I not attain perfect Enlightenment." And again, O Ananda (This was addressed to him by Buddha Sakayumuni) when that Bhikkhu Dharmakara had spoken such prayers, he also apoke the following verses (from the first to the eleventh verses are here omitted) "12th, O Bhagavat, (this was addressed to the Tathagata Lokesvararadja) if these vows of mine can be realized in the future, may this great chiliocosm of thousands of worlds tremble, and may a shower of wondrous jewel-flowers descend from the gods in the cosmic void". Then again, O Ananda, when that Bhikku Dharmakara had concluded his reciting of such exalted prayers, at once the sphere wholly trembled in six manners, and wondrous flowers gracefully rained down from the sky, also there was a heavenly music sounding with praise: "Thou art sure to obtain the unsurpassed, highest, and perfect knowledge of Thy fulfilment." Then, the blessed Ananda asked the Buddha: Has that Bhikkhu Dharmakara now become a Buddha or not yet? The Buddha (Sakyamuni) replied to Ananda: The Bodhisattva Dharmakara has now already become a Buddha; and in the western part from here over a hundred thousand kotis of Buddha-worlds, there his Buddha-country is situated, and it is named "The World of Peace and Hapiness."